The new year is all about new starts and fresh beginnings. So many of us use the new year as the perfect time to organize and declutter. Here some really great ideas to inspire you and get you started- everything from the kitchen to the kids' playroom to your personal planner! Organizing and Decluttering Ideas may have been shared at some of these fun parties! I really need to declutter and so does everybody else I know! You've covered every area of the home and I'll be starting from here TODAY! I was saving egg cartons for craft projects that will never be done, so small Christmas ornaments can go inside those. I like the reward cards key ring too. No more holding up the line while this ditzy grandma digs around in her purse! And I'm going to find a shoe bag for my granddaughter's Barbie dolls. Those things are everywhere at her house - on the floor of course! Thanks for the great collection - I'm on my way and haven't even clicked on anything yet! What a great list of Organizational ideas. This time of the year is a great time to get organized. It is a new year and new beginnings. I cannot wait to check out several of these ideas. I will be visiting many times this week to get them all checked out. Thank you so much for including my quilt. It is a great way to save all those old clothes without tossing them out. Thanks for sharing these wonderful ideas for organization! Wow! so many articles! i'm definitely pinning this so i can read it when i have time. Great resources! Joy, thanks so much for including two of my posts! Wow! Some great links, Joy! Thanks for sharing them. Maybe this will be the year I get more organized! these are all terrific inspiration. Organization makes me smile. Hugs.P.S. I hope you will share at my hop. Really great collection of ideas!! I need to get busy!! Thanks for linking up at My 2 Favorite Things on Thursdays! Come back again next week!! Thanks for getting all these together. Definitely some inspiration to get organising here! Over from Funtastic Friday, I shall pin it too, as there is definitely things I need to check out. Hi Joy! 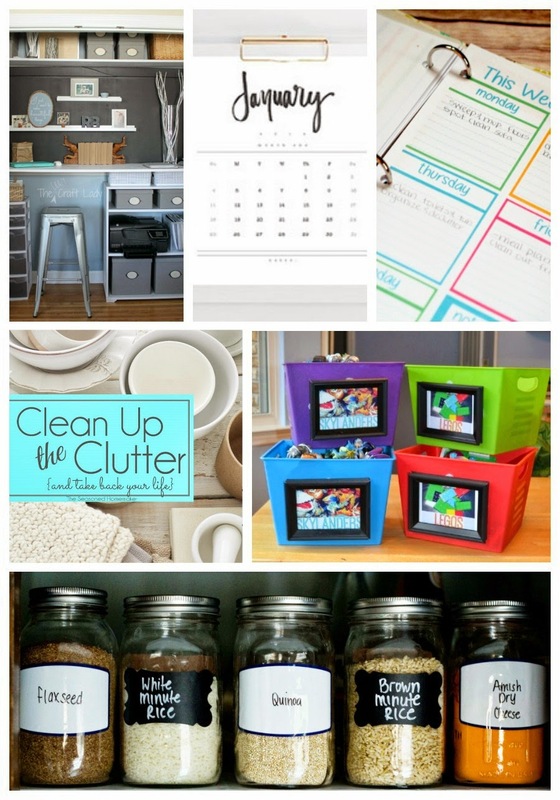 This is an awesome resource for anyone who wants to organize their home. Thank you so much for sharing. Pinning it! What a great resource - so many great ideas! These are great ideas! I am making it my goal to make my ENTIRE house organized! Thanks for linking up! I so need some decluttering in my life. I need to make it a priority! Thanks for the inspiration. Pinned and stumbled! What a great roundup! I need to come back when I have a little more time. I love organizing and started off with a bang. Now things have come to a halt, but I hope to get back to it. I would like to wipe all of my kitchen cabinets down with Murphy's oil. Thanks for sharing with SYC. Oh boy.....I need all the organizing & decluttering help I can get!!! This post is my happy place with so many different organizing ideas! Inspire Us Thursday Link Party on Organized 31. Great ideas. I should actually try some of them. Could make life easier. Thanks for linking up to Funtastic Friday. Hope to see you again soon.